Inspeed's rugged handheld wind meter with dual digital display measures speeds from 5 mph to 125 mph (higher speed models available on request). The unique tilting head folds flat for storage. Stop guessing at the wind speed and risking a poor setup. Measuring the wind speed is not only useful - it's informative, it's key, it's accurate, and it's fun. Plus - the large rotor on this hand held anemometer means that you get accurate readings without pointing it into the wind, unlike pocket impeller-type devices. There is nothing fragile about the Vortex Hand Held Wind Meter. Featured during CNN live Florida hurricane coverage in 2004 and 2005! 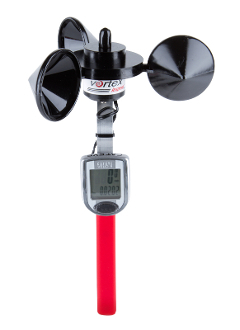 Use the anemometer for storm chasing, kitesurfing, windsurfing, target shooting, model aviation, weather monitoring, and all kinds of wind-related activities. Displays Current Speed plus Average or Max speed at the same time. 4% accuracy from 10 to over 50 mph, good to 125 mph (higher speed models available on request).